The historic Army and Navy Club Building will play host to the first of the 2008 Architectural Conservation Lectures of the Heritage Conservation Society (HCS). In this first installment, Tina Paterno, a professional conservator practicing in the USA, will speak on conservation procedures and issues on Saturday, March 8, from 9 a.m. to 12 p.m. This project is brought to you by the HCS in partnership with the Manila Historical & Heritage Commission (MHHC) and the Museo ng Maynila. The three lectures of Paterno are (1) Soiling on Limestone: Diagnosis & Cleaning Methodologies; (2) Survey, Research and Diagnosis as Phase 1 of a Restoration Project; and (3) Brief Discussion on the Performance of a Consolidation Treatment (Ethyl Silicate) on Adobe. Lunch will be provided by the MHHC. After lunch, individual consultations on specific project-related conservation issues will be accommodated. Interested parties should make an appointment. The lecture is open to the public. However reservations are encouraged by informing the Heritage Conservation Society of your intention to attend. 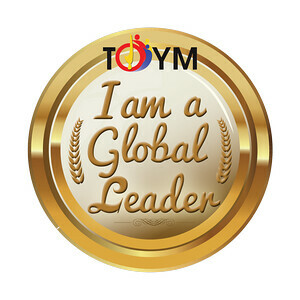 Please contact our secretariat at 5212239 or 5222497. In lieu of seminar fees, your kind donation to the HCS will be much appreciated. 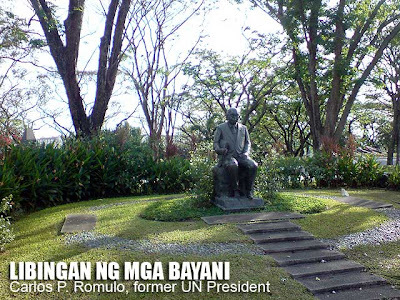 Have you ever visited the Libingan ng mga Bayani? The last time I remember entering the place was way back in kinder during one of our field trips. I've seen the Manila American Cemetery much recently, several times in fact since I'm awed by how grand, serene and well-maintained the place is. And it's sad that our own national cemetery could not compare to an American cemetery on Philippine soil! 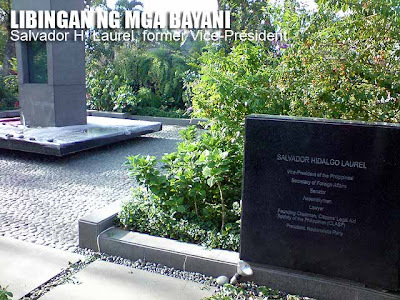 So while I was killing time in Fort Bonifacio last Saturday, I decided to pass by Libingan ng mga Bayani. 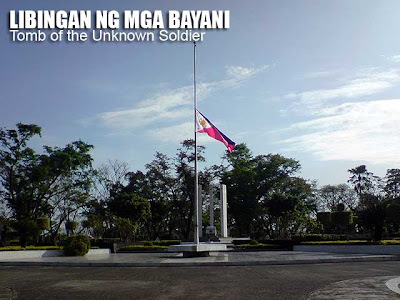 The entrance reads: "I do not know the dignity of his birth, but I do know the glory of his death" which are the words of Gen. Douglas MacArthur from his sentimental 1961 visit to the Philippines. At the center of the whole cemetery is the Tomb of the Unknown Soldier. 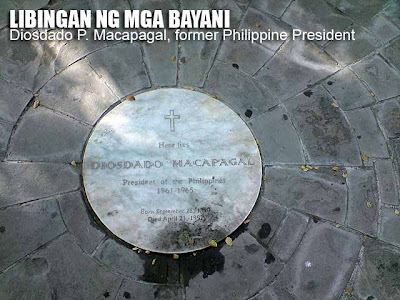 And around it are graves of various Philippine dignitaries including two former presidents, Carlos P. Garcia and Diosdado P. Macapagal. 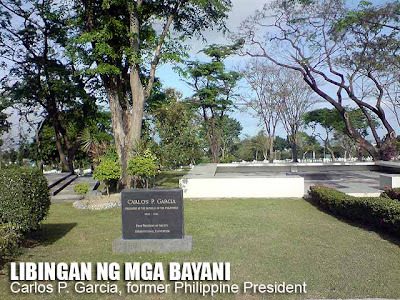 The older Manila North Cemetery has three presidents namely Osmena, Roxas and Magsaysay. 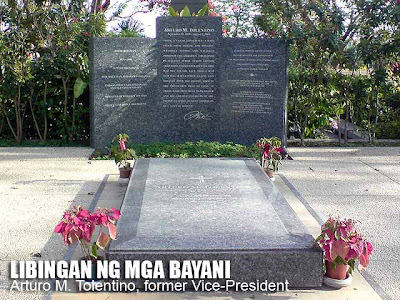 Also buried in the dignitaries section of the Libingan ng mga Bayani are former vice-presidents Arturo M. Tolentino and Salvador H. Laurel. There is also UN General Assembly president Carlos P. Romulo, for chief justices Enrique M. Fernando, Fred Ruiz Castro and Claudio Teehankee, Sen. Blas F. Ople and PCGG Chair Haydee Yorac among others. 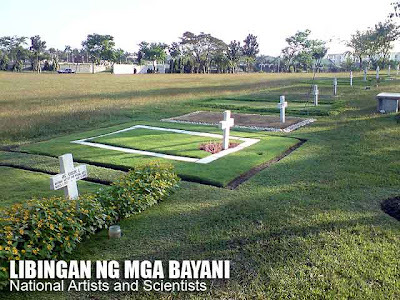 The Libingan ng mga Bayani also has a section reserved for national artists which serve as the final resting place of names such as Nick Joaquin, Ang Kiukok, Jose T. Joya, Levi Celerio, Teodoro M. Locsin and NVM Gonzales. The only thing I didn't like about the area was that the graves were too simple for national artists and scientists, simply marked by crosses, no room for creativity. OT: I've virtually turned down every opportunity to travel for the past one and a half months. That includes two international trips and a host of local destinations. Bear with me as graduation requirements have been filling up my schedule. But summer has a lot in store which is why I'm already excited! This nondescript entrance gate gives no hint of the treasure one can find inside. In fact, I got lost looking for it. 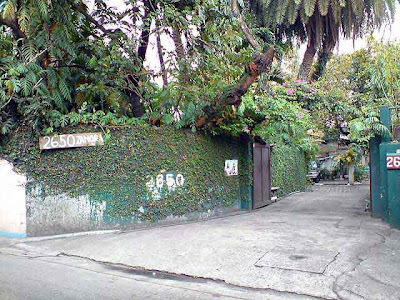 2650 Zamora Street is the 1940s residence of Pablo S. Antonio, National Artist for Architecture. It's now open to the public and is Pasay's best kept secret! 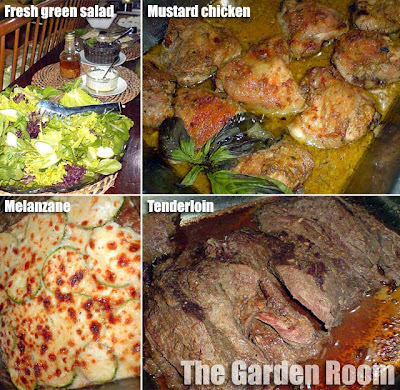 The house plays host to The Garden Room, a by-reservation dining haven run by his family. Every room of the house has been converted into a dining area and it can host several groups at any given time. It was a perfect venue for our HCS board meeting yesterday. 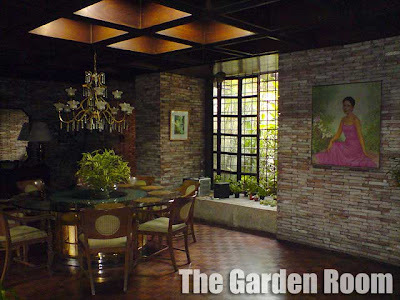 The Garden Room has a refreshing ambiance owing to Antonio's "green" design for his residence. The whole house seemed to be shaded by trees and other plants. Small pocket gardens can also be found around the house. And what is nice about it is the consistent use of natural lighting in the different rooms. There are five set menus ranging from P700 to P900 per head. All set menus come with fresh fruit juice, fresh green salad with oil and garlic dressing, and assorted dessert tarts. The guava juice they served us was rich! All the food was great and the cakes were heavenly! On EDSA, if you're coming from Makati, make a right at Zamora Street (it's the street before the LRT and there's a Watsons store at the corner). Then watch out for the house. It does not have any signage outside so you'll have to look for the house number. From Makati, take EDSA. The street before Taft Avenue is Zamora Street. There is a Watson's store at the corner. Make a right there and just go straight until you reach No. 2650. Unknown to many in the country, the Philippines has a long list of great surfing areas. Here are some of the more popular surfers' haunts where you could ride the waves or simply get lessons if you are a beginner. The Philippine Surfing Federation gave me the first eight and I added two more. On top of the list is none other than the "Surfing Capital of the Philippines." The Cloud 9 wave can be found in the town of General Luna and has put the Philippines in the world surfing map. 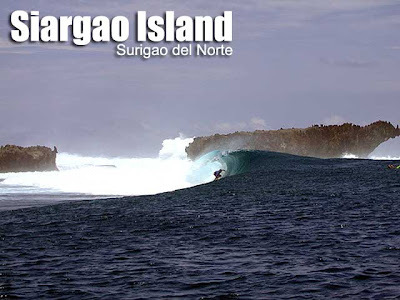 Other popular breaks in and around Siargao Island include Jacking Horse, Tuason Left, Rock Island, Stimpies and Pacifico. Check out the Sagana Resort website for detailed information. Thanks to Sagana Resort for the Siargao photos. According to Sagana, the best months for surf in this area is from August up to the start of November when the area gets the most typhoon swells and the best winds. From May to July, the surf is generally smaller. From December to April the winds are often strong and cross shore. But they say that the swell is always pretty big and some surfers prefer this time of year. Puraran Bay in Baras, Catanduanes is home to the famous mighty Majestics reef break that produces awesome long-barrel waves. The waves are at their finest in August and September. The place itself is a picturesque backdrop of coconut trees and small hills. Although course, the white sand is clean and the water is crystal clear. But as they say, if you are a surfer, "Puraran equals Majestics period!" Most have heard about Sabang, a beach break 5 to 10 minutes away from the town proper where most of the tourism establishments are found. Cemento on the other hand is a reef break which is 30 minutes away from the town proper. But you can easily get lessons in Sabang Beach. Check out my Baler surf adventure: More summer fun in Aurora. 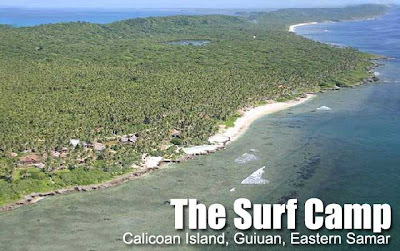 Calicoan Island is home to The Surf Camp. And the great news for surfers is that ABCD Beach has both left-hand and right-hand waves. The season runs from April to November, with the summer months perfect for beginners (with gentle 2 to 3 foot waves). Latter months offer bigger and more challenging waves. Few people know that way beyond the resorts of Pagudpud is a secret hideaway called Blue Lagoon, the best beach in that part of the country. Saud Beach may be great, but Maira-Ira is astounding! And what's great is that on a windy day, the beach is perfect for surfing! Home to the Billabong San Juan Surf School of Luke Landrigan, San Juan is a perfect place for longboarders. And it's very accessible too since you can take any bus to Ilocos and get off just a few meters from the San Fernando-San Juan boundary. This is another surfing haunt I got to try for myself. According to the Surf Lanuza website, "Doot Poktoy is endowed with some of the best waves in the world. And when the waves are good, they can measure up to the world renowned waves of Siargao and Hawaii. Located on the southern edge of the Northwestern Pacific typhoon belt, the waves driven by the winds of the typhoons are unpredictable. If a strong typhoon passes close enough, surf can reach almost 15 feet, with 9, 11 or 14 waves per set and up to twice as many waves per hour as a long groundswell like affecting Indonesia and Hawaii. The Surf Report Magazine describes Lanuza as "a place with a flawless river mouth. Its waves spin long perfect rights on a big swell at low tide. There is a hollow tube section at take-off and there are long section walls up to 200 meters." Kido's Point has been a popular site for surfing competitions in Ilocos Sur, attracting participants from surfing areas all over the country. 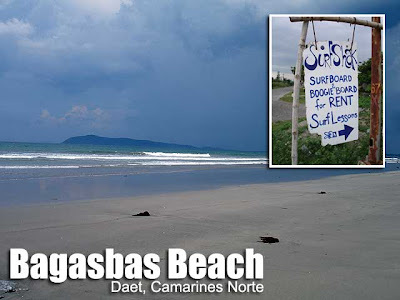 The place got its name from Cabugao's local surfing hero Kido Cabasug. The Canoe Beach Resort in Pundaquit, San Antonio is where professional surfer Joseph "Joe" Villatora from Kauai, Hawai conducts his surfing lessons. 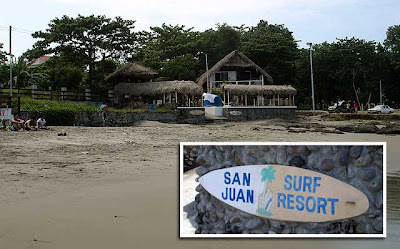 This is another great surfing area located on the Pacific coast of Luzon. When you're hungry, check out Alvino's Pizza, a popular surfers hangout. We ended our Up, up and Away in Pampanga tour with a trip to the Candaba Bird Sanctuary. It was a long drive through rough roads. While the bus was entering the area, several flocks of birds were making their way towards the trees. Sadly, it was getting dark and we didn't see as much birds as locals said there were days before since many of the visiting birds had already started their migration home. 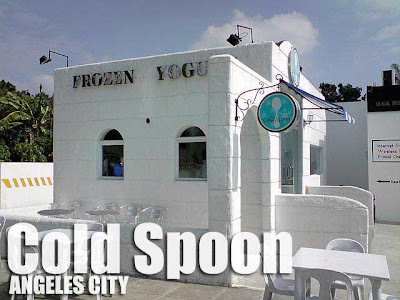 Pampanga: Cold Spoon serves the best frozen yogurt! I was told that the best frozen yogurt in the country can be found in Angeles City. And Cold Spoon did not disappoint. It's along Friendship Highway at the corner of the Carmenville Gate 3 access road. There were just so many toppings to choose from. For my pick, it was Butterfinger bits. If I only could have another one, I would have tried out Comstock blueberry, Oreo, Maltesers or muesli! Yummy! And hear this, they have a drive-thru window for those on the run! 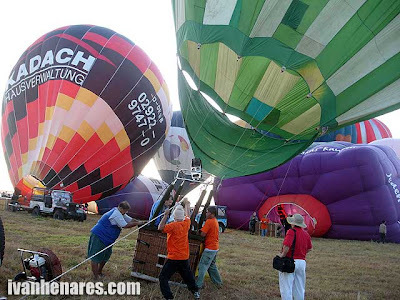 It was the last day of the 12th Philippine International Hot Air Balloon Fiesta last Sunday and we were hoping that today wouldn't be like the previous day. We got our wish! At least our waking up in the wee hours of the morning paid off. Although it was a bit cloudy, the winds weren't strong so the hot air balloons were able to inflate and take-off. We were lucky to get photographer's passes for the group (they only sell 100 passes a day) which allowed us to come close and literally touch the hot air balloons! By 7:30 a.m., most of the hot air balloon had taken off for their hare and hound race. And we were off for breakfast at VFW. I took these photos using my Sony Ericsson K850i. 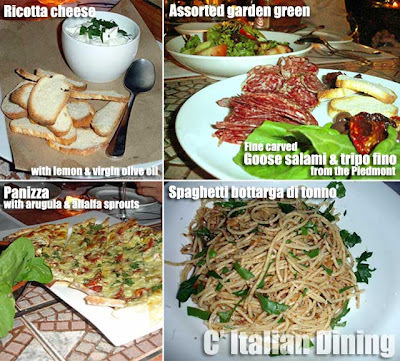 Pampanga: C' Italian Dining is simply superb! 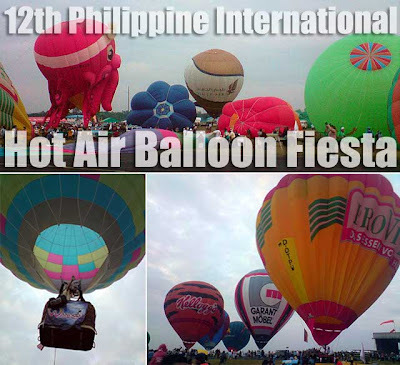 We went to the 12th Philippine International Hot Air Balloon Fiesta late Saturday afternoon hoping to see the night glow. But just like the hot air balloon events that morning, it did not push through since the winds were just too strong. People were joking it was all hot air but no balloons. But that wasn't much of a setback since the highlight for the night was dinner at a by-reservation restaurant called C' Italian Dining, one of the best Italian restaurants not just in Angeles City but in the entire country. 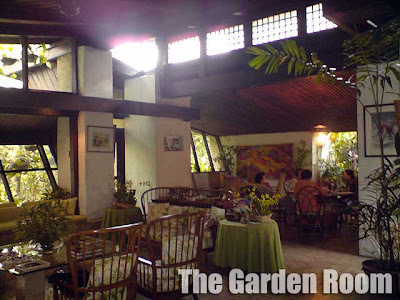 It was twice named Best Restaurant by the Philippine Tatler. We had a four-hour, 10-course dinner that night! 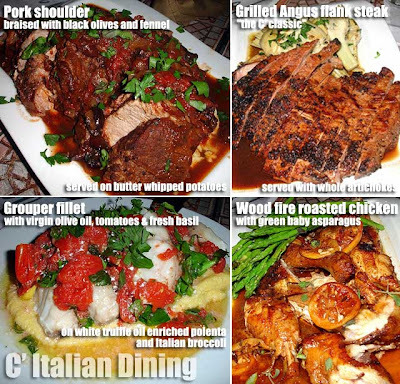 (5) grouper fillet baked with virgin olive oil, tomatoes and fresh basil presented on white truffle oil enriched polenta and Italian broccoli; (6) wood fire roasted chicken with green baby asparagus; (7) pork shoulder braised with black olives and fennel served on butter whipped potatoes; (8) grilled Angus flank steak "the C' classic" served with whole artichokes; (9) lemon cheese cake and (10) chocolate panna cotta. 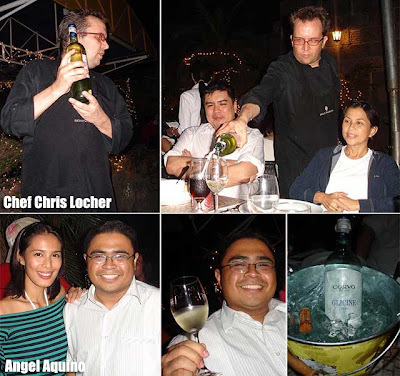 We were also given a wonderful white wine called Corvo Glicine right before the grouper fillet was served. I also got some kiwi and apricot-flavored Italian soda. It was no surprise that after dinner, we simply could not move!!! 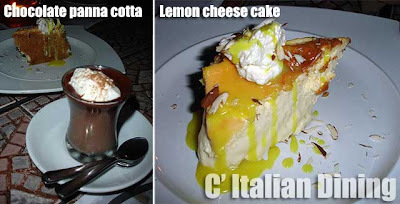 Indeed C' Italian Dining is worth the visit! Win a Boracay weekend party for 19 people! Imagine this... you can bring 18 of your family and friends to Boracay on a chartered SEAIR flight, stay 3 days and 2 nights at Escondido Beach Resort, and receive P50,000 cash to splurge and a K850i to document the whole party! Sony Ericsson is giving a Boracay Party Weekend Package to one lucky purchaser of a Sony Cyber-shot mobile phone (K800i, K810i, K550i, K770i or K850i) from February 1 to March 31, 2008. For more details, visit any Sony Ericsson Concept Shop or call (02) 7891860. Now this one is open to all owners of camera phones, regardless of brand. Join the Top Shot photo contest and win a SEAIR Adventure Pass for two, P10,000 in cash and a Sony Ericsson K850i Cyber-shot phone! All you have to do is upload you camera phone photos here. Now have you ever heard of Kapampangan pizza? 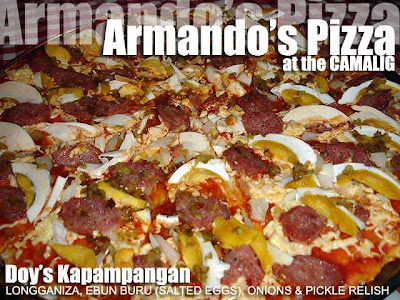 If not, then you must visit Armando's Pizza at the Historic Camalig Restaurant, the old Nepomuceno rice granary in Angeles City, that had been converted into a restaurant. And what toppings might one find in Doy's Kapampangan? Longganiza, ebun buru (salted duck eggs), onions and pickle relish! It sounds nasty, but tastes heavenly! I've always been a fan of pizza at the Camalig. The crusts are baked to a perfect crisp with a generous serving of toppings. 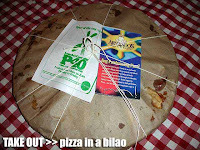 And if you choose to bring some home to your friends and family, the packaging is a novelty as well since the pizza is placed in a bilao and wrapped in Manila paper like pansit. Well, we're passing by the Camalig after our tour on Sunday. Yum! I got to meet YouTube celebrity Christine Gambito, more popularly know as Happy Slip, at the exclusive Happy Slip Meet and Greet event today. The Department of Tourism designated her as an ambassador for Philippine tourism given her popularity on the Internet. She's been traveling around the country and I'm eager to watch the videos from her tour. Win a SEAIR ticket to Boracay! I'm so happy about SEAIR, I've decided to give away a free round-trip airfare gift certificate to Boracay to one lucky blogger. So how do you join? The only thing you have to do is blog about SEAIR and say why you deserve to win the ticket. To qualify, your blog entry must have a link to the SEAIR website and a trackback to this entry. Deadline is on 26 February 2008, 8 p.m. and I'll randomly draw the winner from all qualified blogs that evening. The gift certificate I'm giving away will be valid from now until 15 October 2008 except during super peak dates like Holy Week. Also check-out SEAIR's Hangar in Multiply to find out about the latest deals. Good luck and happy blogging! 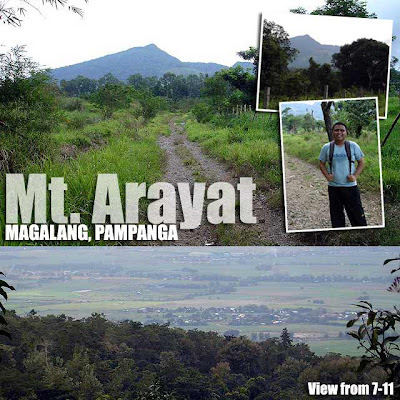 Mount Arayat towers over Pampanga. And you definitely cannot miss it since it's the only mountain you'll see in the plains of Pampanga as you drive along the NLEX. Ever thought of climbing it? Well, there are two ways to get up. The first is via the Mt. Arayat National Park in Arayat, Pampanga. 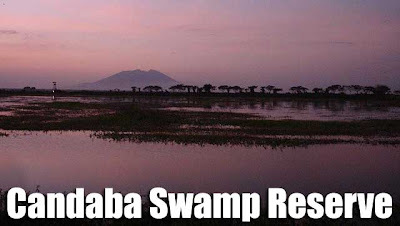 While the second is via the town of Magalang, near the Pampanga Agricultural College. This mystic mountain has always been an important symbol in Kapampangan folklore being the home of Aring Sinukwan, the legendary deity of the ancient Kapampangans. There is also a thriving Rizalista community in the Arayat side. I was able to visit their shrine several years back. We did an ocular inspection of Abe's Farm last Sunday in preparation for our tour next week. And we decided to hike up Mt. Arayat. Since we arrived late, reaching the summit was out of the question. So we had to settle for a resting area called 7-11, an hour away from the jump-off point. It's called 7-11 because there is a convenience store there. 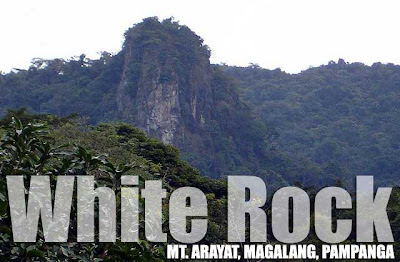 From there, you could see the famous White Rock, a rock formation seen from afar and which is more defined during the summer months when the plant growth dries up exposing it completely. You also have a view of Pampanga but not as spectacular as from the summit where you'll be afforded views of the Pampanga River meandering towards Manila Bay. For the Magalang side, you can arrange for guides with the Pampanga Agricultural College or Abe's Farm. They charge PHP1,000 per guide and they usually come in pairs, one in front and one at the end. But you can try negotiating with them too.